Digital Freedom Academy Reviews - Legit or Scam? Digital Freedom Academy Reviews – Legit or Scam? 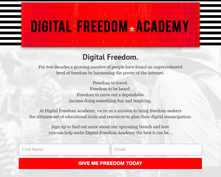 Digital Freedom Academy, found online at DigitalFreedom.Academy, is a new company that says their goal is to help anyone be successful working online, regardless of their current knowledge or experience. Their website says that for more than twenty years people have been able to find financial and personal freedom by using the internet, they want help others use the power of the internet to free themselves from boring, uninspiring, and potentially underpaying work. Digital Freedom Academy says that internet based products and services are still in their prime, and that people with no experience whatsoever still have an opportunity to profit from a side business or even by launching a full independent business. Their program and book wants to “unlock the mysteries of how people make a living from the internet” so that all their customers have a chance to live a life with more freedom, fun, and fulfillment. The biggest concern about this program is that there isn’t any program yet. As of right now, all customers have is the promise of a program and the opportunity to submit their email address to their website. Once you’ve submitted your email address, you then have opened yourself up to receiving marketing, advertising, and sales emails of any product from Digital Freedom Academy, either of their creators, or any partner companies they work with. At this time, it appears that the only real goal of this company is to collect leads in order to contact you directly at a later time when they have something to sell, not that they really and truly want to help people learn how to create their own online business. In fact, it appears as though this company is planning on ultimately selling their educational book on Amazon.com, which means that interested customers might just want to wait for the book to be available to the public and not have worry about being inundated with sales emails in the meantime. Digital Freedom Academy Reviews ? Average Rating for " Digital Freedom Academy Reviews " is 1 out of 5 based on 1 reviews. hello. i'm interested in your product and i really want to know more about the way of what you advertise. so if you can help me, it will be great. Your review is completely misleading. Anyone who knows Matt Stone aka Buck Flogging of Digital Freedom Academy knows he is the real deal.